There’s nothing more attractive than a confident smile and nothing worse than a stern lecture from your dentist. Why not take care of both with a simple, cost-effective, and hygienic way of keeping your teeth pearly white? 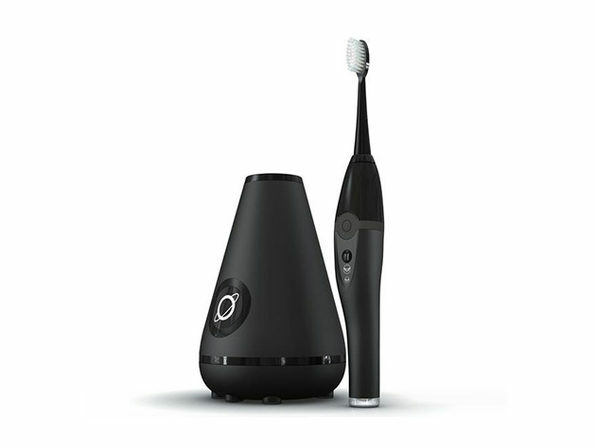 With a TAO Clean Sonic Toothbrush & Cleaning Station, clean your teeth and your bush with an advanced two-in-one system. This teeth-cleaning system makes it easy to keep your teeth healthy and attractive — here’s how it works. Kick things off by brushing your teeth with the TAO Clean Sonic brush, which gives you a state-of-the-art 40,000 strokes per minute. Then, place the brush in the spaceship-style Clean Station when it’s not in use, so it’ll be dry and 99.9% germ-free the next time you’re ready to brush. All of this helps you get and keep a pearly white smile by removing tough stains, as well as plaque while preventing environmental contaminants from messing up your daily cleanings. On top of that, this brushing system is cost-effective and flexible to meet your needs. Since it comes with three brush heads that each lasts a long time, you won’t be needing to buy replacements anytime soon. Plus, thanks to its two easy-to-control cleaning modes, you can get a professional or sensitive cleaning with every use to best match your mouth’s comfort. What’s more, this brushing system — which comes in black or white — will look great in your bathroom no matter its style. Get this advanced-brushing system for 45% off at $69.99 in The Daily Caller Shop.